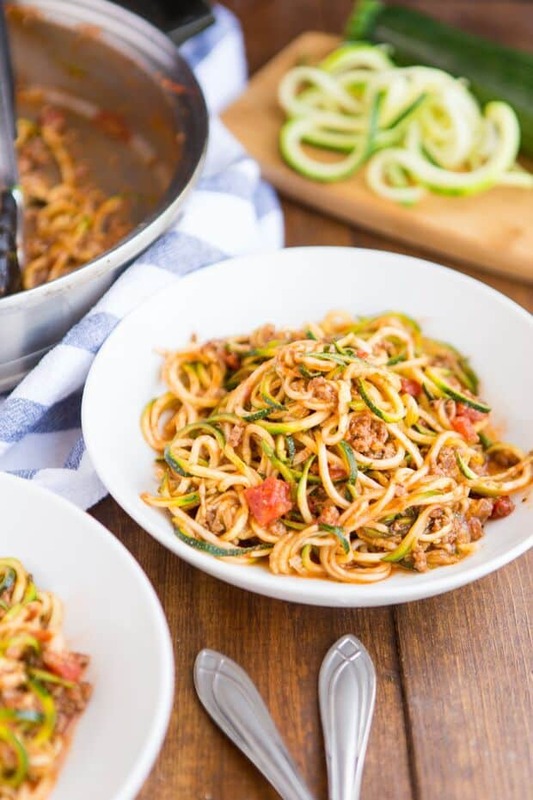 These easy and healthy zucchini noodles are the perfect substitute for traditional pasta! Pasta is one of my favorite foods. I love, love, love me some spaghetti. Whenever I’m trying to watch my weight, I have such a hard time giving it up. Why do carbs have to be so fattening?! It’s one of my all time favorites and I just don’t want to live without it! 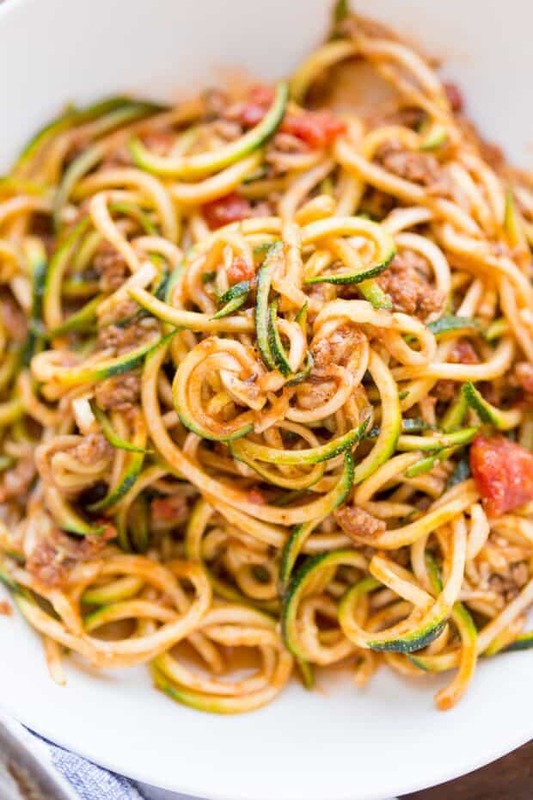 Enter this genius zucchini noodles recipe to the rescue. Have you guys seen those Pins on Pinterest for “Zoodles“? They’re zucchini that you make into noodles. It sounds funny, right? Well they are actually genius and they are so easy to make! 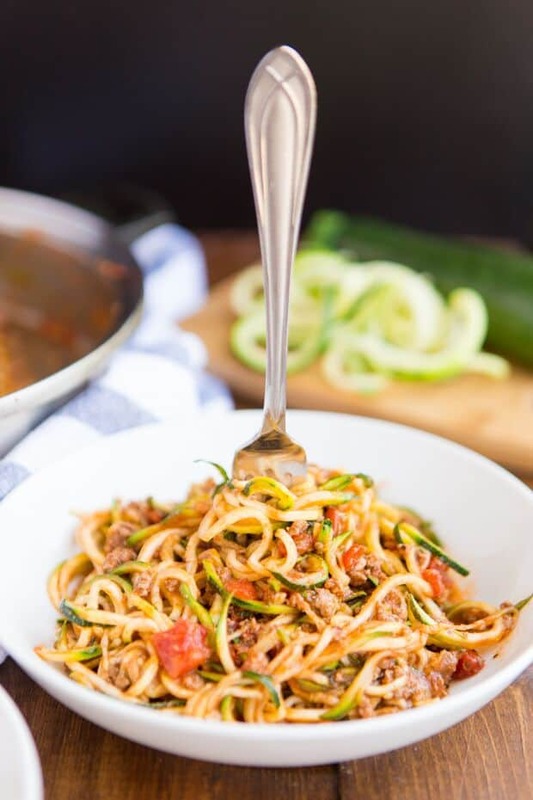 Zucchini Noodles are the PERFECT gluten free, low carb alternative to pasta. 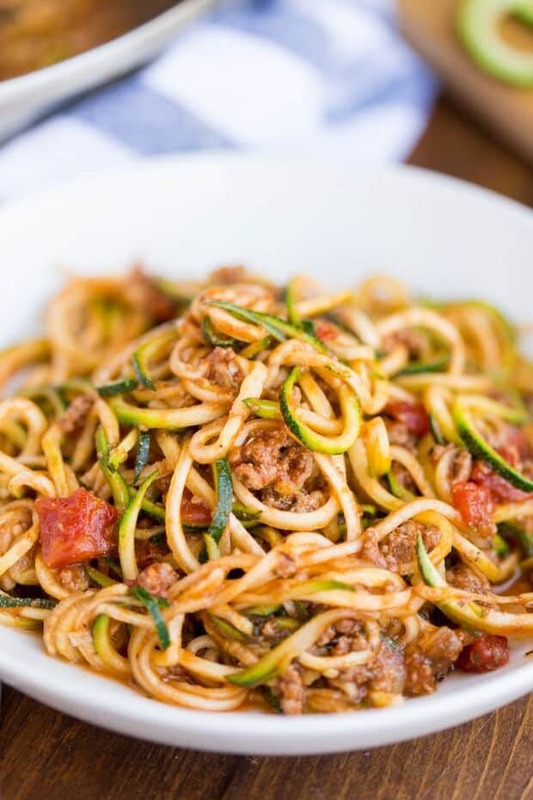 So many people can benefit from eating Zucchini noodles! Whether you are dieting, gluten intolerant, or you just want to add something new to your recipe box, these noodles are for you! 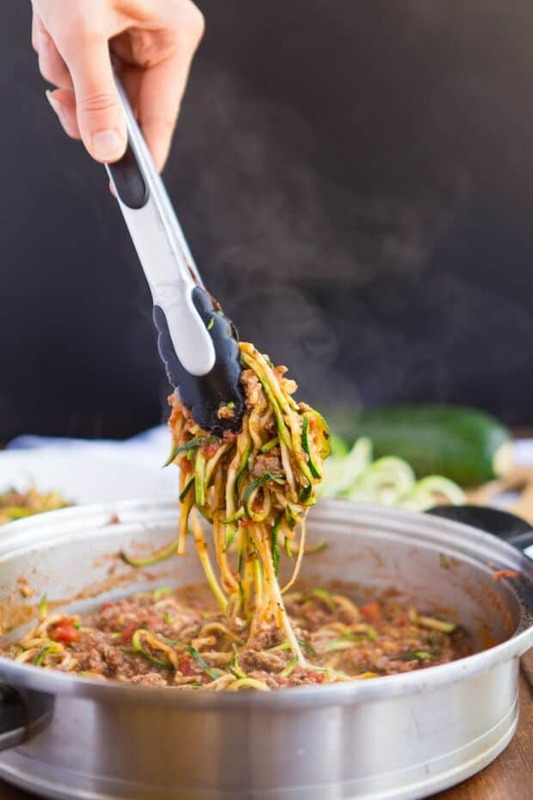 I picked up a spiral slicer off of Amazon after seeing a few healthy recipes that called for “zucchini noodles” and other vegetables that were spiralized. I didn’t know how well it was going to work and I was really surprised that my noodles came out perfect on the first try! It took all of about 60 seconds to turn my zucchini’s into zoodles. It wasn’t hard at all! I’m not one of those people that usually picks up extra kitchen gadgets, but this one was definitely worth it. My zucchini noodle maker has become a staple in my kitchen. I looked everywhere for the best price on one of these bad boys and found one for a great price on Amazon for you guys! It’s the best! You can also make Zucchini Noodles with a knife or vegetable peeler. It definitely isn’t as fast, but it works! I can create a lot of zucchini noodle recipes now everything from recipes using pesto, to chicken — even shrimp. Anything I would traditionally serve with spaghetti, I can serve with zucchini noodles. Because I’m on a “low carb” diet I can’t have regular spaghetti sauce, and who has time to make everything from scratch? I definitely don’t with 2 little boys 3 and under running around. So I asked around and found Rao’s Marniara Sauce only had 4 grams of carbs per serving compared to other store bought brands that had 16-20 grams of carbs per serving. Perfect! Now, I can enjoy my healthier spaghetti recipe no problem and I still stay in line with my weight loss goals and have good food, too! I can create a lot of zucchini noodle recipes now. Everything from recipes using pesto, to chicken — even shrimp. Anything I would traditionally serve with spaghetti, I can serve with zucchini noodles. So I asked around and found Rao’s Marniara Sauce. It only has 4 grams of carbs per serving compared to other store bought brands that had 16-20 grams of carbs per serving. Perfect! Now I can enjoy my healthier spaghetti recipe no problem, and I still stay in line with my weight loss goals and have good food, too! When cooking with Zucchini Noodles I prefer using some garlic, salt and pepper. I like to keep it simple. 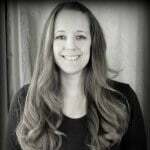 If you haven’t already checked out the weight loss program that I’m on you can check it out here >>> it’s called Medifast. For those of you who are on the program and found this recipe on the internet this sauce was suggested by Nutritional Support and it is DELICIOUS! I cook the zucchini with over medium heat for about 3-5 minutes or until your zucchini noodles are start to get tender. Definitely make sure you’re checking your noodles. Nobody likes crunchy “pasta”! Tomato or Marinara Sauce: This is a bit obvious, but the perfectionist in me had to put this on here! 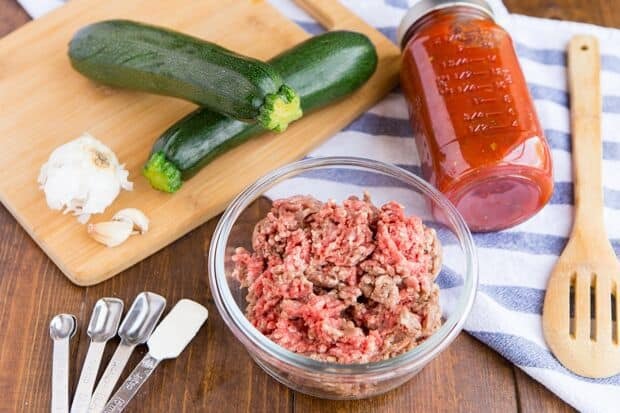 Ground Beef or Ground Turkey: If you want to get REALLY healthy with this recipe ground turkey tastes really good. Meatballs: Italian style meatballs taste the best in my opinion. Parmesan Cheese: A classic spaghetti add-on of epicly delicious proportions! Obviously you wouldn’t add cheese if you are on a diet. Cheddar Cheese: My daughter prefers this over Parmesan, so the perfectionist in HER mad me add this one. Olives: Olives give anything a salty taste, but my grandma eats spaghettie (and now Zoodles) this way. I’m guessing she can’t be the only one! Yes! Just use a freezer safe, airtight container to store them for up to a year. I have found they start to lose flavor the longer they’re in the freezer, so I would suggest using them sooner than later. 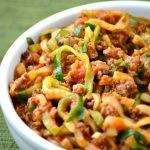 You can’t go wrong with a good zucchini noodle recipe — I think you’ll love cooking with zucchini noodles as much as I do! I promise that you won’t be disappointed in these noodles. I double-dog-dare you to serve them to your kids without telling them they’re made of veggies. I bet they won’t even know the difference! 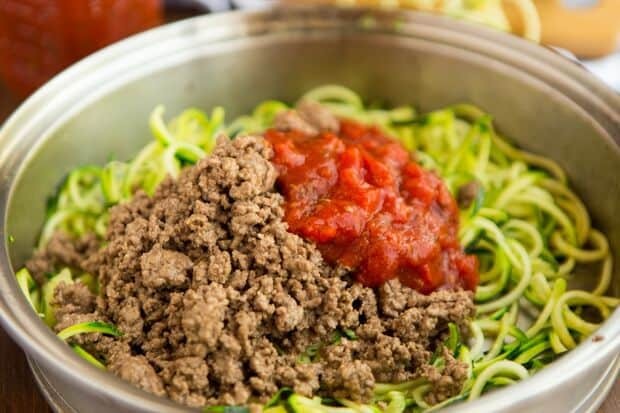 This Zucchini Zoodles Spaghetti is a low carb way to enjoy one of your favorite meals! Cook and crumble your hamburger until it is browned. Drain the grease and place in a bowl and set aside. After the grease is drained wipe most of it out of your skillet with a paper towel, leaving just a little bit to saute your garlic and zucchini. 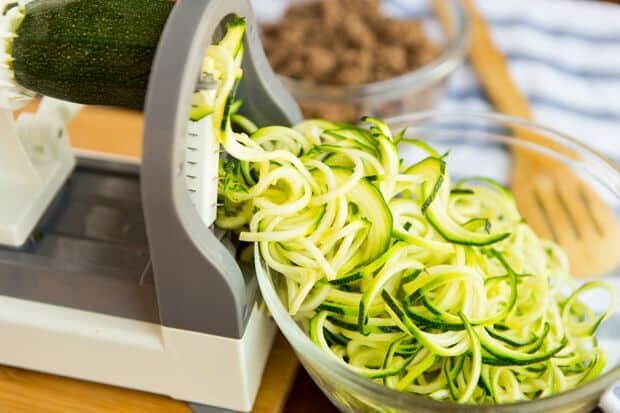 Use your spiralizer to turn your zucchini into zoodles. Cook garlic and zucchini over medium heat for about 3-5 minutes or until your zucchini zoodles are starting to get soft. Add your marinara sauce and hamburger to your zoodle mixture and cook until everything is hot and bubbling, about 3-4 minutes. Medifast Friends... 1/4 cup of Rao's Spaghetti Sauce equals 1 serving of vegetables. Please weigh your zucchini to ensure that you are not eating more than your 3 servings of vegetables on this meal. Superbe idée, ce sera le plat de demain soir. Yum! What a great way to eat zucchini! I too am on medifast and am really struggling right now. Thanks so much. It can be challenging some days for sure Joy! Hope today was a better day for you and maybe this recipe will help?! ?